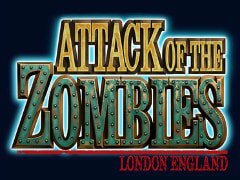 Attack of the Zombies is a title that has been offered to us by Genesis Gaming, being one of their newer releases. As you can imagine, the theme of such a game can only be related to a zombie apocalypse, one which in this case takes place in London. The heroes of the game are four women, armed with zombie fighting appropriate weapons, while the enemies are the various zombies, many of which seem to be members of the royal family or of the court. The game relies for its list of features on things like wilds, scatters and bonus features with free spins. There are a maximum of 50 active lines to be used each round, on 5 reels. The high payouts available will get to $7,500. I did enjoy the design of Attack of the Zombies for the most part, even though the selected drawing style is not the standard one, and the characters don’t look entirely realistic. It’s still a good looking game, and one that I would play again if graphics were the only ones to consider. The symbols start with the Brain, with a Zombie Bonus, with the four ladies that are still human, as well as the crowd of zombie characters. Luckily, there are no symbols which aren’t properly themed here. The big prize of this game, which only goes up to $7,500, is delivered through a symbol which shows us human brains, with a WILD logo underneath it. The role of this symbol is the one I expected, as it’s capable of acting as another symbol from the game, but only if this results in a new combination formation and a win that wouldn’t have been possible without it. Wild Brains are quite capable of aligning themselves on paylines and forming combinations, paying up to $7,500 if the highest wager is also selected. The other symbol, marked Bonus, appears to be showing a crowd of attacking zombies in the dark. You use this one from scattered positions, which will require that you have at least three icons present, in order to both pay you and give you the free spins. 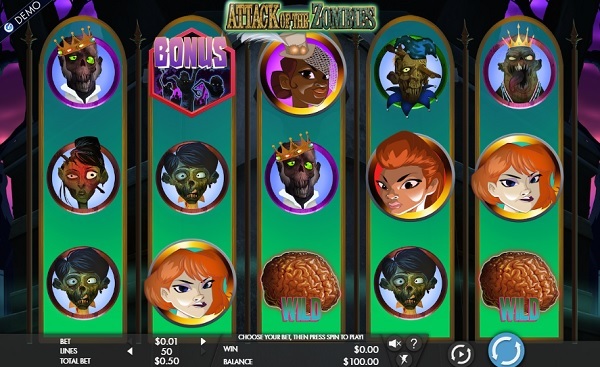 The Antidote Free Spins will transform the four human women into zombies at the beginning. As you get Antidote icons on the 3rd reels, they will be cured, one by one, until they’re all healthy again. As they’re cured, they are turned into wilds for the remainder of the free spins. After the last human is cured, you have one more free spin, and then the feature is over. The design is not overly realistic, and the payouts are not as high as I want them when it comes to that top jackpot, but those are not big downsides. Attack of the Zombies approaches a popular theme and does a decent job with it, offering some unusual features and interesting graphics.